Start point: Killarney - looped walk, so also end point! 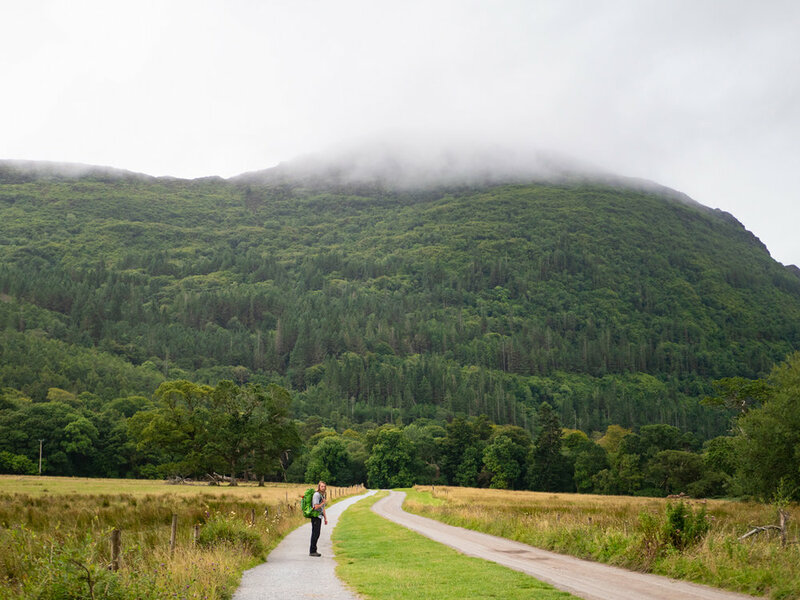 Although quite a few people end at either Kenmare or up near the black valley, where the loop reconnects, instead of walking the whole way back into Killarney. Beware, there isnâ€™t a straight forward way of getting back from the split! Camping/accommodation: The Kerry Way has some of the best infrastructure out of all of the Irish National Waymarked Trails. We camped in campsite in Killarney, stayed in a hostel in Black Valley and Glencar. We then wild camped outside of Glenbeigh, and stayed in another hostel in Caherciveen. We stayed in a hotel in Waterville and Sneem, followed by a final hostel in Kenmare! There werenâ€™t as many official campsites as I would have liked, and while weâ€™re happy to wild camp, it was such a busy area that we decided just to go with the hostels. We arrived into Killarney the night before, after the longest bus journey of our lives from Dublin. The town was beautiful but busy, and we hurried to the reception of the camp site we were staying at as reception was technically closed already - weâ€™d called ahead once we realised the bus wasnâ€™t going to get us there anywhere near the time it had said. When checking in we found out that they only took cash, we decided to divide and conquer; Carl would go and pitch the tent while I walked back in towards town to get cash. It wasnâ€™t a long walk, and after Iâ€™d paid I went to wander in the dark in search of carl and my sleeping bag. It was busy, and in the dark childrenâ€™s shrieks pierced night. I found Carl surrounded by some large tents in a quiet corner, and I helped him finish setting out our gear, speaking in hushed tones so as not to wake our neighbours. It wasnâ€™t long after 2am when the first group arrived back. A group of women slowly stumbled past our tent, and as they woke me I was afraid someone was about to fall on us. Clearly after an exciting night out, they talked loudly into the still air. One lost a shoe. Someone else was going to get sick. Then a lighter was lost. Someone then turned on the headlights of their car, blasting us in their beam of light, so that they could figure out how to open the tent door. It was nearing an hour later when the lads arrived back. The women to our left had at least managed to get all of each other inside the tent at that stage, but hearing the activity outside they started to re-emerge. When the very uncomfortable, skin crawling flirting started I actually had to stick my fingers in my ears. It would have been better to sleep beside the screaming toddlers two rows down from us. When our alarm went off at 6am I felt like crying, but my eyes were too tired to bother. I think thereâ€™s a strange trap that people fall into in when thinking about their home country - no one goes and sees their own â€œtouristyâ€� places, because itâ€™s full of tourists. So instead we fly away and be a tourist somewhere else. On the morning of Day 1 we walked back into the town and grabbed some coffee in a small cafe between one of the many lavish hotels. My sleepy memories of those early hours were taken over by one thing (excluding the coffee): tour buses. Seeing bus after bus drive through to pick up tours after their breakfast, or shuttle the early risers off to their new activity was more startling than I expected. This was going to be more busy and intense than Iâ€™d thought. 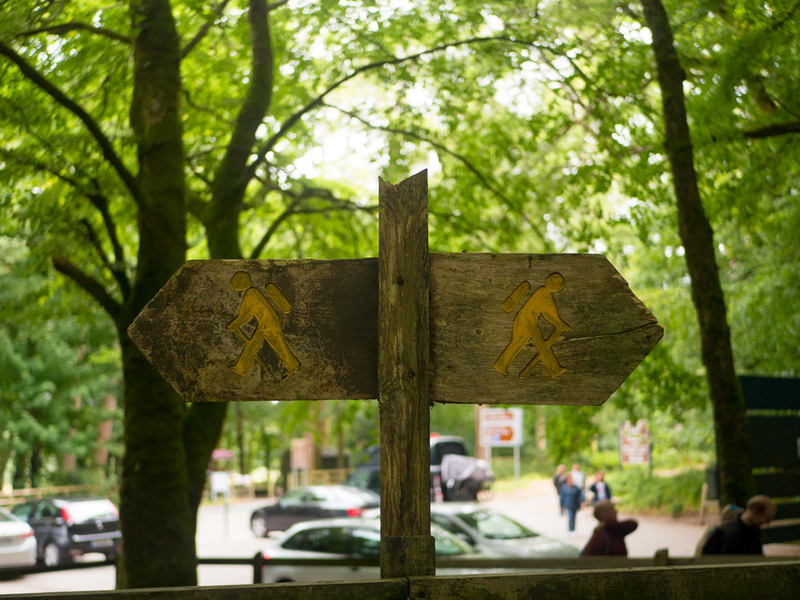 The trail starts with a long, wide footpath that leads out to Muckross House. The house was built in the mid 1800s, and was given to the Irish state in 1932, becoming the first National Park in Ireland (forming the base for Killarney National Park). The grounds were beautiful to walk through - and it was as we were wandering our way through that we met Patrick. A tall, energetic man, he was walking to Kenmare for the day, and as he powered along we had to work to keep up. We chatted about hiking gear and walking for a while and he told us about some of the best viewpoints in the area. We parted ways outside the house, and headed for Torc Waterfall. Torc waterfall and the surrounding forest was surreal, leaving us feeling like weâ€™d stepped into a painting. We were lucky, arriving in between other groups, and so got to grab a few quiet moments there before starting up the old stone steps that wove up the hill side. It was fun to push and puff our way up the hill, relishing the first climb of the trail. Around the top of torc hill we came to a badly signposted junction and took a wrong turn, turning back not long after when we decided that we werenâ€™t supposed to be heading down hill again so soon. Error fixed, the trail started to empty out as we left behind the smaller forest loops. The ground levelled out and we walked along a gravel path in a higher valley. The trail wound and meandered through long grasses, across small wooden bridges, and past beautiful viewpoints. It was at the end of this stretch that we came to â€œthe splitâ€�. Most looped trails have a split, where the arm that links the trail to the major starting town meets the actual loop of the trail. Weâ€™d decided to do this trail the traditional way; anticlockwise. We took the turn towards Black Valley, watching the large rain clouds follow along behind us. We met another walker as we reached Lord Brandon's Cottage, and chatted while enjoying a break from the now consistent rain. Lord Brandon's Cottage is a cafe on the lakeside, with a large outdoor roofed seating area - plenty of room to hang out wet coats and bags. The rain didnâ€™t let up for the rest of the day, the clouds sitting low in the sky. When we reached the Black Valley Hostel we were happy to be inside. The reception of the hostel is also a little shop, where we stocked up on snacks and food for dinner. The hostel is half of a house badly converted into dorms, with a large kitchen and small living room, but it served its purpose. A important thing to note is that the hostel isnâ€™t in a village - thereâ€™s nothing else at the end of this stage (no shops, pubs, etc.). Throughout Day 1 we filmed a short â€œlive updateâ€� video; when walking we try to have a trail video for every Saturday, and that day being a Saturday we decided to just film something short and sweet! That night, finding a tiny corner under the stairs in the hostel I balanced the hard drive on my knee and quickly cut the video together, while all our clothes dripped dry upstairs. Itâ€™s never hard to get up early in a hostel (there are too many other moving bodies), and so we were packed and moving pretty early. As we stepped out the door we entered the clouds. Everything was coated in glistening droplets, and while it wasnâ€™t quite rain, we were instantly soaked again. Dew sat on top of the braids in my hair, spider webs creating tiny showers for the plants below them as fences shook or branches moved. That day we walked passed Irelandâ€™s highest mountains, and saw nothing but clouds. It was beautiful, but a little disappointing not to see those huge peaks - our only views were for fleeting moments of their outlines looming high above us. Much lower down where the two mountain crossings of the day. The first section brought us along a small road, past a farm house and through a low pass. As we pushed into the first climb of the day we met a farmer criss-crossing the ankle twisting slope with gusto, whistling and calling as he went. Meeting him at a junction of sheep trails he asked if weâ€™d seen a young sheep dog. We told him we hadnâ€™t, and he nodded along, not looking too worried - apparently other walkers had started feeding his youngest dog bits of their food when they stopped for breaks on the hill, and so the dog had taken to wandering the slope in hopes of a second breakfast. He gave us a wave and kept going, treating the pitted land like a perfectly smooth dance floor. We made it up and over that first climb, although it was tricky to tell how much we were climbing with the clouds dragging along beside us. Our place in the world remained a mystery all morning, until we arrived at the Cooky monsters Cafe. Technically we arrived before they had opened, but it was a cafe right beside the trail, we were not walking past it. We sat on their benches outside, and once they were open ate lunch with a large table of other walkers. Just remember the only cafe rule - which is to take off your coats and bags when you arrive and leave them in the locker room. After a slow lunch, and a bottomless pot of coffee, we eventually got up to make our way over the second climb of the day, which was immediately in front of you when you walked back out the gate. The second climb is the more serious one of the day, the trail switch-backing its way up. This time as we climbed the farmer we met was also climbing the pass. This seemed like something he did every other day, and we had some awkward bunny hopping happening as we took breathers, and then he would stop further on to check a fence. The views from the top of this climb were wonderful on both sides of the pass, and as we worked our way down the steep decent the trail wound around a small stream that quickly turned into a gushing river as we reached the valley floor. After following a grass road for a while thereâ€™s an option to take a road route or across another couple of small hills. We stuck to the hills and this section was quite overgrown, but nothing not manageable and mostly just involved wading through chest high ferns (chest high for the very short. Maybe only elbow high for taller folk). I was glad we took this route as we walked through a beautiful mossy forest, which lead to a couple more heather-coated hillsides and then the road into Glencar for late-afternoon. It had been so long since we walked a trail with such defined stages that it felt so strange to not walk until dusk, and actually put down our bags and just relax for the evening. The Hostel in Glencar is also a pub, a small shop, the local post office and a tea rooms. The hostel section has nice beds and a large kitchen where we and two other travellers cooked questionable dinners before having a couple of drinks as it got dark. We could have woken early, but we stayed in bed until we could avail of the free breakfast, draining more than one cup of coffee. We left the hostel following road for a bit before turning down grassy lanes that offered glimpses and moments at a lakeside. While the trail doesnâ€™t literally climb mountains it is energetic, dipping and rising constantly throughout the day. Walking from Glencar to Glenbeigh itself was only about 16 or so kilometres, and it was a beautiful walk. The National Waymarked Trails arenâ€™t particularly old, however following the worn stones through light, airy forests it felt like we were walking along a route thousands of years old, possibly somewhere taken straight from a Tolkien book. This place was made for angelic elves to glide through. It was as we were making our way through a switchback bend that we saw it. Our first four sided Elvis. Elvis is the name weâ€™ve given to the little yellow walking man that all the National Waymarked Trails use as their way-marking. Often at trail junctions there are posts that have Elvis on multiple sides. At this point we were guessing that weâ€™d probably seen the most westerly, southerly and northerly and easterly Elvisâ€™s. Heâ€™d been painted on walls, stones, roads and trees. Weâ€™d even come across Priscilla - supposedly the only little painted yellow woman walking way-marker, which you can find on the Sheepâ€™s Head Way. But weâ€™d never seen a black post with an Elvis on all four sides. Itâ€™s funny how, when your life becomes a series of hill climbs, road sections, and yellow way-markers, finding a post like this is really, truly exciting. We sat there for a while eating wine gums smiling to ourselves. After that we had a small climb up to the Windy Gap, which was true to its name, and so we kept moving as we passed through, enjoying the view as we were slowly, relentlessly propelled forward and down again. Once we made it to Gelenbeigh we wandered around looking for somewhere to eat but it all looked a bit out of our price range. We went into a petrol station and bought our lunch, sitting on the benches outside. The road we were on was a wind tunnel, and we very quickly got very cold. It was still very early in the day, and with no hostels or campsites that we knew about we didnâ€™t see much point in stopping in the town. Tired from the draining powers of the cold, we slowly got going again. The trail out of Glenbeigh went right beside the coast, cut into the side of a large hill. As we passed Ross Beag beach we were able to see across to Inch Beach on the Dingle peninsula, and wave across to where we had been a year ago, which was a little surreal. Somehow that evening of walking felt like it was all gently up hill. While the sun broke through for a while, the rain was never far away and fog slowly swallowed our view across to our right of the Dingle peninsula. To our left, cold wispy cloud fingers curled over the mountain. It wasnâ€™t long until we had our hoods up once more, the wind whipping the drops at us in every direction. We reached a forest where weâ€™d roughly planned to camp, but the hard ground was sprouting tiny rain-streams everywhere we looked. Continuing on, we reached a point where we could see our next road section ahead of us. This meant that our walk to Cahersiveen tomorrow was going to be incredibly easy, but that we had to find somewhere to camp right now. There was nothing good, and the wind and rain kept us awake most of the night. We also just had a bad case of the camping jitters that night for no explainable reason. All in all, it was not that restful. We awoke under a layer of thick damp, a damp that had sunk deeply into everything. There are few things worse than pulling on wet gear, but thatâ€™s what we did. It was very early when we got moving, and even though we plodded along very asleep for four our five hours, we arrived into Cahersiveen for 11am. Going into Cahersiveen meant taking an offshoot section of trail, walking down an arm that weâ€™d have to retrace our steps back along the next day. Once in Cahersiveen we booked into the hostel, and then went and found somewhere dry to drink coffee while we waited for the hostel to actually open. I canâ€™t remember the name of the coffee shop, but it was just a short walk down the main street from the hostel on the left hand side. There was a covered outdoor seating area out the back, where we were able to sit surrounded by dripping gear without feeling like we were in the way, or causing any water damage. Back to the hostel, we showered and took stock of our stuff. Itâ€™s really amazing how wet everything can get. We keep everything in dry bags, so technically everything wasnâ€™t wet, but everything that would be on or touching us was. By now we had a pretty routine drying process, opening the one tiny window in the room, shaking everything out, opening all zips and ties. Wet socks were squeezed to within an inch of their lives, then lined up on the end of the bed to â€¦ well they rarely get to dry, but maybe be a cold, less intense damp in the morning. After a nap we went and walked around the town, saw the incredible guard tower house, and filmed a video about our favourite trails so far. Another slap-dash trail dinner in bed, and then a long night of sleep where we pretended we didnâ€™t hear the storm outside. That is the end of the Kerry Way Blog Post - Part 1! When thereâ€™s a link to part two Iâ€™ll add it in here. If you like our blogs, you can subscribe to get them straight to your inbox. Here is this the link to The Kerry Way Video: Part One! There is also a Part Two and Part Three if youâ€™d like to take a look! Weâ€™ve been nominated for some awards recently! We were at The Outsider Awards on the 30th January, shortlisted for the Breakthrough Achievement Award (and even though we didnâ€™t win we still got pretty wooden medals!). On the 29th of March weâ€™re heading over to Mayo for the the Irish Adventurer of the Year Awards.